I am taking a bit of a break this week.. a break from food, that is. Today I’m embarking on a three day juice cleanse. As today marks the first day into the program, I thought it would be fitting to share a juice recipe. This juice tastes surprisingly like a Dreamsicle. Those frozen orange flavored ice-cream filled popsicles were a childhood favorite of mine. 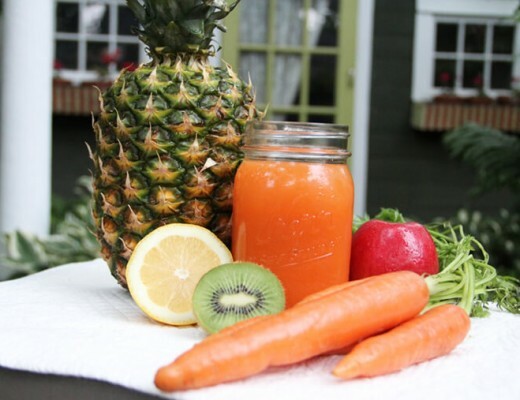 The juice is a better alternative because its fresh, healthy and totally delicious. Whats the secret ingredient is this juice? Sweet potato! It adds a delightful creaminess to the mixture. This wonder elixir has many beneficial properties including detoxifying the liver and lowering inflammation. 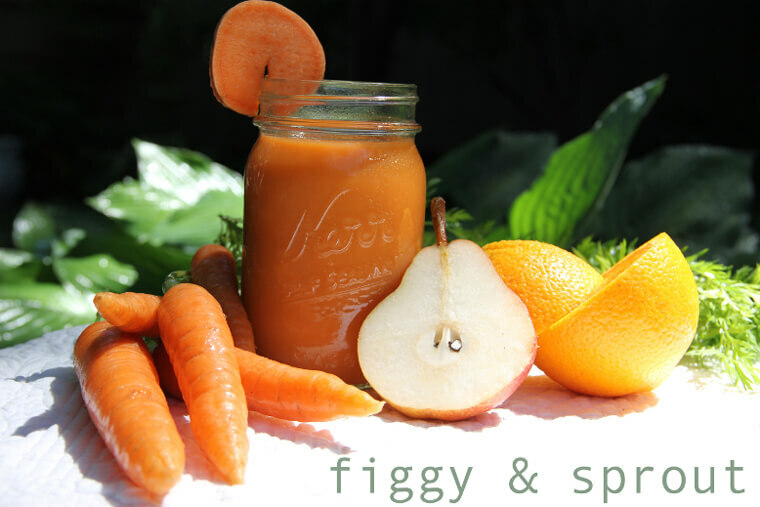 The mixture of carrot, orange, pear and sweet potato is chock full of phytonutrients, carontenoids and antioxidants, which pack a powerful punch of nutrition. Carrot juice has been demonstrated to rapidly alkalize the body and cleanse the liver and improve the quality of the blood. With 116% of the daily recommended amount of Vitamin C in just one orange, oranges are a great way of boosting the immune system. 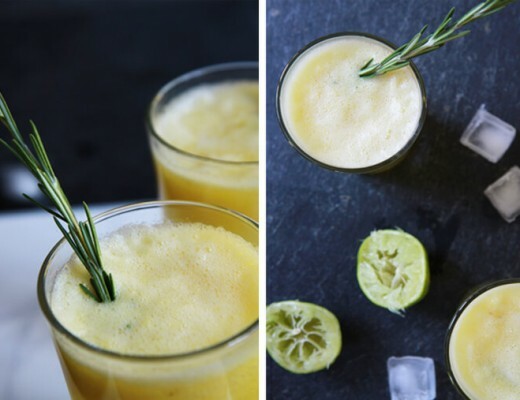 Go ahead, treat yourself to this sweet and refreshing juice. Place everything in the juicer and juice away. I’ll be posting more about my experiences as the cleanse goes on. Feel free to ask questions if you like. Have any of you ever done a juice feast or fast? If so, how did you feel? That is a great question! I suppose it’s hard to wrap your head around the idea of consuming a food that is normally baked, but raw sweet potatoes taste really good and they’re good for us. You will be pleasantly surprised. Sweet potatoes are one of the greatest sources of beta-carotene of all vegetables, even higher than carrots. So they are great for boosting the immune system. Some people even enjoy eating raw sweet potato sticks – this is something I still need to try. Just be sure to give them a good wash before consuming or juicing. This juice is so delicious–I’m glad I checked your archives and found it! I’ve just started juicing in 2013 and this is my favorite combo by far (I’ve mixed in some mango and clementines when I don’t have all the components on hand…mmmm!). Thanks! Hi Sam, I’m so happy you liked the juice! It’s one of my favorites as well! I’ll have to try your version soon – sounds tasty :) You just can’t go wrong when mango is involved. Hehe. 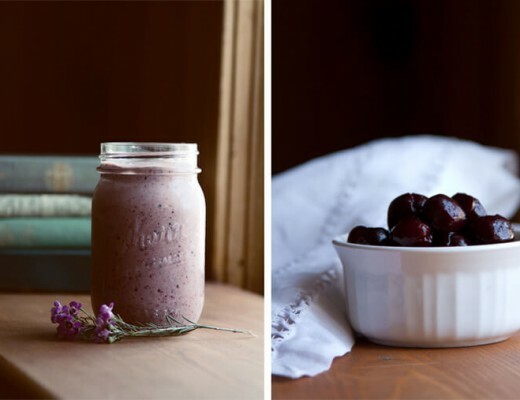 I have some other juice recipes I’ve shared on the blog. You’ll have to let me know if you try any others. Best of luck with your juicing!